HOW often do we hear that we should do what we love? Celebrating 40 years of Graffiti Publications and its flagship, Australian Street Rodding Magazine, Larry O’Toole has not only survived but thrived while many other specialist publishers have come and gone in what is a cut throat industry. Chatting with a semi-retired Larry in his Castlemaine based business that employs six people, it becomes clear that there are two key success factors to the business’s longevity. Authentic and customer focussed pretty much sums it up. Ask him what the magazine is about and Larry has no hesitation in responding. “Owning, building and modifying street vehicles with an emphasis on pre 1948.” In addition Graffiti Publications prints and franchises over 300 specialist books and DVDs relating to the modified car industry. Ever since there has been a project in progress in Larry’s back shed; an interest that ultimately brought him to Castlemaine in 1973. He was part of the very first wave of street rodding enthusiasts drawn to Castlemaine where interesting things were happening in this field. Many of these enthusiasts started out with back yard hobbies and, like Graffiti Publications, evolved into successful businesses. Four partners formed Graffiti Publications in 1976 as an after-hours enterprise. With a disappointingly slow start and personal circumstances intervening, three of the partners sold their shares to Larry and wife Mary who became the sole owners in 1989. While Mary has worked hard to provide administrative support in between raising their four children, and their son Allister now handles the bulk of the editorial production work, Larry is undoubtedly still the public face of the business. Over the past forty years he has attended all the major events across Australia to chat with enthusiasts and gather more knowledge and material for the magazine. In addition he has attended the American Street Rod Nationals for over thirty years. With such diligent research Larry knows his market well. Rather than being driven by advertising, Graffiti Publications is unashamedly customer focussed that has created a loyal subscription base Australia wide. Flicking through the latest edition, the magazine clearly promotes a sense of community featuring reports from clubs and events across Australia and New Zealand. While Australian Street Rodding Magazine is stocked in newsagents in every state and territory, the subscription base is an important part of their business and special attention is paid to rewarding members of the Graffiti Club with special offers and a free advertisement to sell their cars. A newsletter promotes inside and breaking news. “It’s a bit more work but the return is good,” says Larry. Planning and timing are what Larry excels at. Graffiti has never missed a publishing date, crucial in an industry where being one day late can push a print run back a week. White boards enable staff to plan day-to-day operations and the publication schedule is set up to twelve months ahead to stay on top of multiple deadlines. In-house production right up until the print ready phase helps them control both quality and timing to minimise delays. “Our customers are die hard enthusiasts and expect their magazine to be delivered at the same time each month. Unfortunately Australia Post is creating a challenge for us. What used to take two to three days is now taking in excess of a week,” he admits with a hint of frustration. Larry’s planning skills also benefit the industry and wider community. Looking decidedly weary, he has just participated in Graffiti’s 40th Anniversary Celebrations and the Boogalo Invitational held at Castlemaine coinciding with the largest ever Australian Street Rod Nationals held in nearby Bendigo. All this was perfectly timed to entice over a thousand enthusiasts to the region for the entire month and entertain huge numbers of spectators. Timing is king. 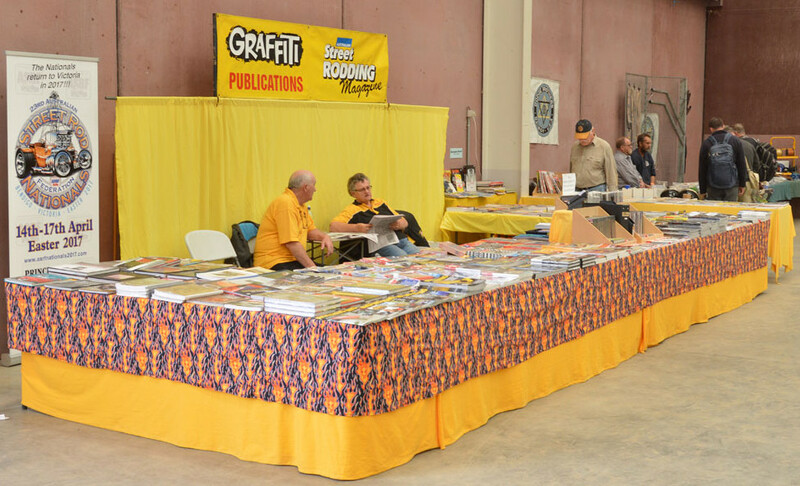 A full colour catalogue printed in October, just prior to Christmas each year, promotes Graffiti’s offerings including specialist books and DVDs. “It works like magic,” says Larry. At a time when everyone is embracing the digital era, Larry is bluntly dismissive of online publications. “Too many have gone down that path and failed.” Graffiti has a website to sell its products and utilises social media to complement their marketing, but that is as far as it goes. A discerning businessman, he instead identifies opportunities such as acting as a franchise for overseas specialist publications that are popular here in Australia. A sister magazine, Hot Rodding International, is currently being positioned to take on the global market utilising new distribution techniques. Sure and steady with an authentic customer focus, there is no doubt that Australian Street Rodding Magazine is Australia’s longest running magazine in this genre for very good reason. Control your own processes as much as you can. Don’t rush into new technology, let them iron the bugs out first.